M.A - New Media, Universiteit van Amsterdam; B.S - Liberal Arts, The New School, NY. I forrestgump about the creative world, like where's waldo in the art fair circuit. I should write more, but I'm absorbing it all until my closet artist's got enough ammo. A few weeks ago I completed and submitted my Masters thesis, ending my yearlong study at the University of Amsterdam’s New Media MA program. Our cohort will officially graduate this Tuesday, 20 Sept, 2011. 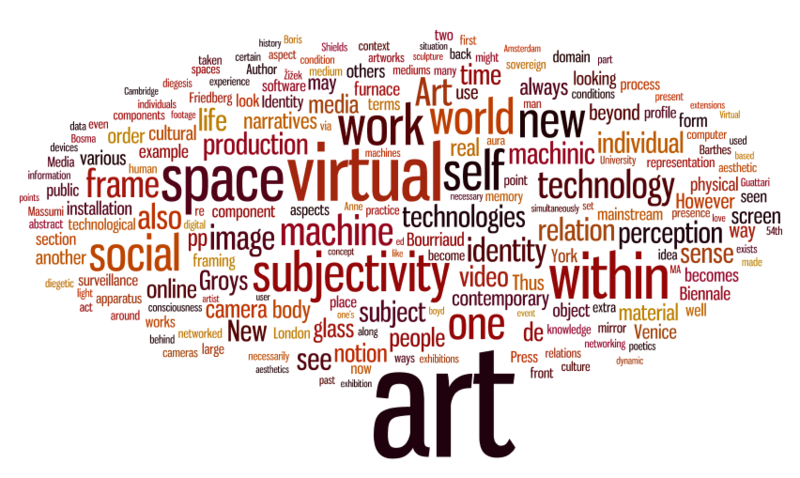 This paper will attempt to address issues of individuation with respect to the mass new media technological landscape, as well as issues of the production of subjectivity in relation to art. By looking at art as a machinic process necessarily employing diverse technologies in order to come into being, I will examine how art is entangled with the production of subjectivity — itself being a technology guided by the virtual territories opened up by art. The first section will look at the individual with respect to the current technological landscape. In this context, the individual is the one confronted with the screen and the eye of technology. By looking at the technology–fueled realities that surround the individual, we can attempt to locate the “objectified subject” within the socio–political domain. The second section examines subjectivity in terms of a process of production — how subjectification both employs, and recursively assimilates into, technologies of narrativity and framing. As subjectivity production is come to be seen in terms of its related art production, I will examine how both mutually traverse and share machinic registers of autopoietic processes. As technologies are extensions of our selves, art becomes a component of the extensions of our limits of consciousness. Further, art comes to occupy the intersubjective domain of our social relations. Here the individual is contemplated as the subject within the frame, or within multiple frames. In this context, we can attempt to locate the “subjectified subject” in the realm of poïesis. For my research, I have examined art works that span various mediums as well as exhibition contexts, drawing primarily on exhibitions that have occurred at the 54th Venice Biennale, and in De Appel and W139 in Amsterdam. Through this research, I hope to reveal certain directions in art and the situations of new medium categories in the contemporary art discourse. Subsequently, I hope to explore and delimit new territories revealed by art for the emancipated subject. For their time, advice and encouragement, I owe special thanks to Josephine Bosma, Noah Brehmer, Merel Cladder, Michael Dieter, Geert Lovink, Sebastian Scholz and John Zinsser. Ask the masters: Top down = control & bottom-up = action?